NCLEJ Board member Ed Krugman joined the organization as a volunteer Senior Attorney in January 2017. Ed recently retired as a Partner at Cahill Gordon & Reindel LLP. Ed has successfully litigated in state and federal courts throughout the country, at trial and on appeal. Known principally for his work in insurance and reinsurance, his practice and background were broader, encompassing virtually every type of business litigation. He has been described as “brilliant,” “absolutely first-rate,” and a “go-to person” by Chambers USA and is one of only five U.S. insurance and reinsurance lawyers named in Euromoney’s worldwide The Best of the Best expert guides. Ed earned a J.D. from Yale Law School, where he was Note Editor of the Yale Law Journal. Previously, he was awarded a B.S. from City College of New York and a Ph.D in Mathematics from New York University. He clerked for the Honorable Irving R. Kaufman, then Chief Judge of the United States Court of Appeals, Second Circuit. 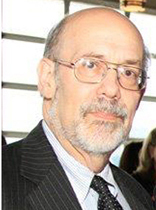 Ed has served on NCLEJ’s Board of Directors since 2007 and chairs the Investment Committee. He is also a member of the Board of Gay Men’s Health Crisis.